Three-Stone Princess Cut and Round Diamond Engagement Ring | Shane Co. Brilliant hand-matched diamonds provide the perfect backdrop to the center diamond of your choice. Two princess cut diamonds, at approximately .21 carat TW, serve as brilliant side diamonds. Twelve round diamonds, at approximately .18 carat TW, are prong-set into the quality 14 karat white gold band, providing a glamorous, modern look. The total diamond weight is approximately .39 carat. I absolutely love my ring. The picture on the website does not do it justice. My fiance had the side diamonds switched to rounds and had the diamond set in six prongs. 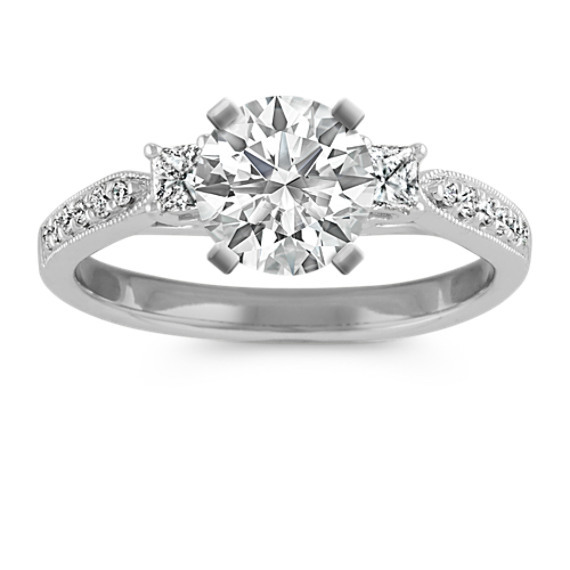 It is stunning...the tiny side diamonds make the center diamond pop. I get compliments every day!